Join us at e's BAR for an Anti V-Day party tonight starting at 7. Made with Johnny Walker Black Jane Walker Edition, the Walk with Jane at e's BAR is the benefit cocktail of the month with proceeds benefiting #MonumentalWomen. St Patrick's Day falls on a Saturday this year. Come down to e's BAR for $7 green beers all day long and our legendary e's BAR Burger is just $5 from 1 PM - 6 PM. Our newest location is now open! Join us at our new location at 2888 Broadway to break in the new spot! Calling all you jokesters! Open mic at e's BAR the second and last Monday of the month in the Rumpus Room. Sign up at 6. Mic fires up at 6:30. Join e's and the NYC Trivia League for weekly Trivia Night each Tuesday. Karaoke at 7! Ugly Sweater Contest with a $50 bar tab prize! 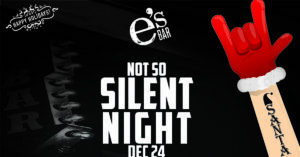 NYE - no cover, champagne toast, DJ and Karaoke! 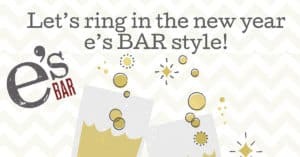 NYE - no cover, champagne toast, DJ and Karaoke! 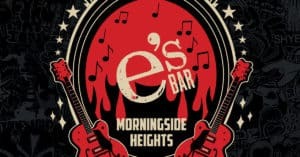 Ring in the new year at e's BAR's newest location in Morningside Heights at 2888 Broadway!